Both are registering now in the studios and online. Both workshops focus on energizing and self discovery including toning the heart and uncovering passion, courage and strength. Thursday: Void of course Moon in Aries from 11:50 am to 8:50 pm ET. Motivation and speediness are likely before 11:50 am. Some will power through situations without taking other people or opinions into consideration just to get things done. You may run into opposition or debate regarding methods or ways of thinking. Mercury squares Jupiter. Questions arise about who is getting too much or too little of money or recognition or voice in the matter. Taurus Moon 8:50 pm ET through much of Saturday. More grounding and better long term decision making is just ahead. Lavender is today's color. Friday: Taurus Moon, solid and determined. It's also good for pleasurable pursuits. Fill the senses and engage in the moment. Moon aligns with Neptune in Pisces and squares the Sun. Creativity, beauty, and art are focuses. Some will make hard decisions knowing the long lasting results. Make promises you intend to keep. Adopt a positive outlook or habit you want to cultivate. Venus moves to Aries. Spring fever arrives early. It's a good date night. Today's color is Pink. Saturday: Taurus Moon is good for conscious decisions including shopping for long lasting value. Moon aligns with Pluto in Capricorn for tangible results in all areas including emotional health. Pluto may expose the shadow side of someone or something so it can be dealt with. Today is well suited to many things so go forward with plans. 5:42 to 11:44 pm ET, the Moon is void and our judgement may stray during this transition time. Mercury in Capricorn continues to favor "doing" including study, building, creating, cleaning and repairing. Gemini Moon arrives 11:44 pm ET for a social and changeable part of the week. Today's color is Blue. Sunday: Gemini Moon aligns with Venus and Mars in Aries. A socially outgoing, mentally dynamic day. Work on your best ideas. Moon aligns with Neptune for imagination. Question, be curious, have healthy skepticism and look out for duplicity. Today's color is Yellow. Monday: Gemini Moon and Jupiter begins a retrograde. Don't be too concerned about the retro time since Jupiter spends a good deal of time retrograde. Moon aligns with Jupiter, Uranus and the Sun. We're full of ideas today. Follow the best leads. Act spontaneously if it seems right. Saturn opposes the Moon for negotiating and differences of opinion. Look at all sides of a situation for the most desirable outcomes. Void Moon 5:53 pm ET until 2:03 am ET. Today's color is Gold. Tuesday: Cancer Moon 2:03 am ET. Mercury moves to Aquarius at 4:35 am ET. Mercury in Aquarius is an inventive, scientific cycle. Visions come to fruition as you put ideas into motion. Cancer Moon squares Mars and Venus in Aries, highlighting differences that can be reconciled. Remove posturing and defensiveness as well as power plays. Instead focus on what is in common. Moon aligns with Neptune for versatility, even in dealing with emotions. Light Blue is today's color. Wednesday: Cancer Moon. Full Moon is Friday at 7:33 pm ET with a lunar eclipse, the first of 2017. The warmup is on. Emotions and situations intensify. Projects need attention. Focus on completions and getting certain things out of the way. Moon opposes Pluto. Consider the shadow or subtle aspects of your current experience or problem. Could bringing something into the open actually help? Uranus and Jupiter are square to the Moon. Self interests vs. fairness and equality are strong issues presenting themselves. "Make or break" time seems relevant. Today's color is Black. February is eclipse season and love month. February's Full Moon bursts with heart energy. Experience physical heart opening practice with plenty of astrological insight on February 11th. Define and move for your heart's desire. Like Beck sings, " Heart is a Drum", and Kate Beever, musician/ music therapist complements our heartbeats and breath with live percussion during yoga. Get in on this action at this link or in the SY studio. 2-3:45 pm at Scarborough Yoga. Thursday: Quiet contemplation. Processing alone or by meeting with others and determine the next course of action. Work through issues of justice, balance, and self versus group. The Capricorn Moon aligns with Venus in Pisces. Be realistic yet gentle and progressive while taking feelings into consideration. Let go of what's futile or unproductive in favor of what can be if you allow it. Welcome fresh energy by releasing a burden you don't need or cannot change. Today's color is Black. Friday: Void Moon 2:18 to 3:37 am ET. Moon to Aquarius, the visionary and scientist. New Moon is at 7:07 pm ET. Venus square to Saturn in Sagittarius. Partners, couples and other duos decide how or whether to move forward together. Avoid sarcasm or snarky ways that may result from bottled up anger or frustration. Move from passive feelings to conscious conversation and self expression. Time beginnings from 7:07 pm on. This ushers in eclipse season since this New Moon leads to the first eclipse of 2017, in Leo on the 10th/11th according to time zone. Today's color is White. Saturday: Mars moves to his home sign Aries at 12:39 am ET. Mars is bold, innovative and rebellious in the first zodiac sign. This begins the Year of the Rooster in Chinese zodiac. Rooster year is about finding peace by confronting fear. In the book Chinese Power Animals, Pamela Leigh Powers notes that the media is constantly feeding fear as are governments and agencies like insurance companies. I would add pharmaceutical advertisements to that list. For a change, take note of what's not wrong and also of how you do have power. Banish some fear and experience more peace in yourself. Aquarius Moon is New and today is a good time to start almost anything as Jupiter and Uranus align with the Moon. Today's color is Red. Sunday: Void Moon 12:52 am to 11:10 am ET. Pisces Moon shifts us to feeling emotions, creative pursuits and spiritual experiences. Respond to and take care of your emotional life today. Mercury and Pluto meet in Capricorn which is another reminder to face fears. Recognize what makes you anxious or creates avoidance and, if possible, gain some perspective. Reverse negative thought patterns by remembering what you're grateful for and what's not wrong. Make a list. Starts are favored this week too. Wear or meditate on the color Blue. Monday: Next time the Moon is in Pisces, in February, we'll experience a solar eclipse (Feb. 26th). Vibrations of what's to come are in the air now. Pisces relates to compassion for others as well as taking care of yourself and your emotions. Be gentle and act to maintain or improve your mental/emotional health and sensitively respond to others, including loved ones in any sort of crisis. Moon meets Neptune so be careful of delusions. Moon aligns with Mercury and Pluto continuing themes of Sunday's forecast. Today's color is Green. Tuesday: Pisces Moon meets both Venus and Mars. Our relationships and ways of connecting with others are highlighted today. Forgive, receive, create or seek safe spaces and emotionally healthy or spiritual practices. Void Moon 12:36 to 4:46 pm ET. Aries Moon changes the tone from subtle and inner to bold and outward. Mercury squares Uranus in Aries. Ideas and inspiration may be followed by quick action. You may feel like there's no time to spare. We need to be careful of sarcasm and verbal outbursts. Today's color is Red. Wednesday: Aries Moon in harmony with the Aquarius Sun for innovation, new ideas and unique self expression. Be authentic and seek the same in others. Explore alternative options or points of view. Beginnings are still favored. Pursue your passions. Today's color is Yellow. Thursday: Mercury moves to Capricorn at 9 am ET. We are still retracing degrees of Mercury retrograde, though the retro itself is over. Revisions are likely if you acted weeks ago and have changed your mind or the situation has shifted. Some will go back on their word or their decision in favor of something completely different. Also, some things may be altered or edited rather than scrapped completely.Void of course Moon 3:55 am to 4:24 pm ET. Be cautious with statements, emails, texts, information and trust during that time. Moon in Scorpio 4:24 pm on. Scorpio holds onto ideas and relationships until well ready to let go. Long term implications are in the forecast if you're taking action on or making anything public. Saturn in harmony with the Moon and square Mars. Difficult feelings and situations arise. Mars square Saturn is not a good time to argue, instigate, or infuriate. Stay away from aggressive people or dangerous locations. Today's color is Black. Friday: Scorpio Moon in harmony with Mercury, planet of communication and planning. Venus in Pisces aligns with Pluto. Find more ease communicating and learning. Seriousness and focus are likely. A quiet thoughtful approach is called for. Relationships are up for examination, discussion and sharing of secrets. Be intentional with communication and conversations. Immerse in projects and priorities. Today's color is Indigo. Saturday: Scorpio Moon aligns with Pluto, Venus and Mars. More intentional energy backing our actions and conversations. Nothing will be taken lightly. Don't mess around or provoke an argument. Do have well thought out personal conversations. Relationships are in focus as Venus and Mars relate to the Moon from the sign Pisces. Where Scorpio Moon holds onto hard feelings, Venus may help smooth stormy waters with the sensitivity and compassion of the sign Pisces. Void of course Moon starts at 8:24 pm ET until 5:45 am. Today's color is Red. Sunday: Sagittarius Moon arrives at 5:45 am ET and is in harmony with the Aquarius Sun. Expect and engage in forward thinking, letting go more easily, community involvement, experimenting and innovating. Sense of adventure and willingness to explore alternative and topics. Read, learn, be inspired and do. Today's color is Turquoise. Monday: The Sagittarius Moon squares Neptune as Mercury in Capricorn aligns. Examine romantic notions or things you're looking the other way about instead of dealing with. Moon in harmony with Uranus for speediness. Insensitivity could be an issue as could impulsiveness. Venus and the Moon square bringing up differences in ways of thinking, willingness to forgive or move on, and relationship crankiness in general. Today is a bit unsettled. Wear Purple. Tuesday: Sag Moon void of course from 12:43 to 5:43 pm ET. Moon in harmony with Jupiter and meeting Saturn means action with both opportunities for growth and learning as well as finalizing pending matters. Have some responsibility with your sense of freedom and vice versa. Moon square Mars increases the chance of disagreement or disagreeable behavior which may come passive aggressively since Mars is in Pisces. What's bubbling under? Moon in Capricorn 5:43 pm on for grounding in tasks and creating order. Today's color is Black. Wednesday: Capricorn Moon aligns with Neptune and meets Mercury for creative and effective use of words. Communicate well, clearly and without making problems personal. Be on time. Show your talents, abilities and willingness to take charge where needed. Today's color is Green. February is filled with astrological action. The first of two eclipses is in Leo on the night of February 10th. We'll dance it out to live drumming by Kate Beever at Full Moon eclipse Yoga in Scarborough. Come in to connect with the power of both Moon & Sun & reenergize as daylight begins to visibly increase! Astrology infused Yoga & more at Scarborough Yoga. Feb 11th 2-3:45 pm. 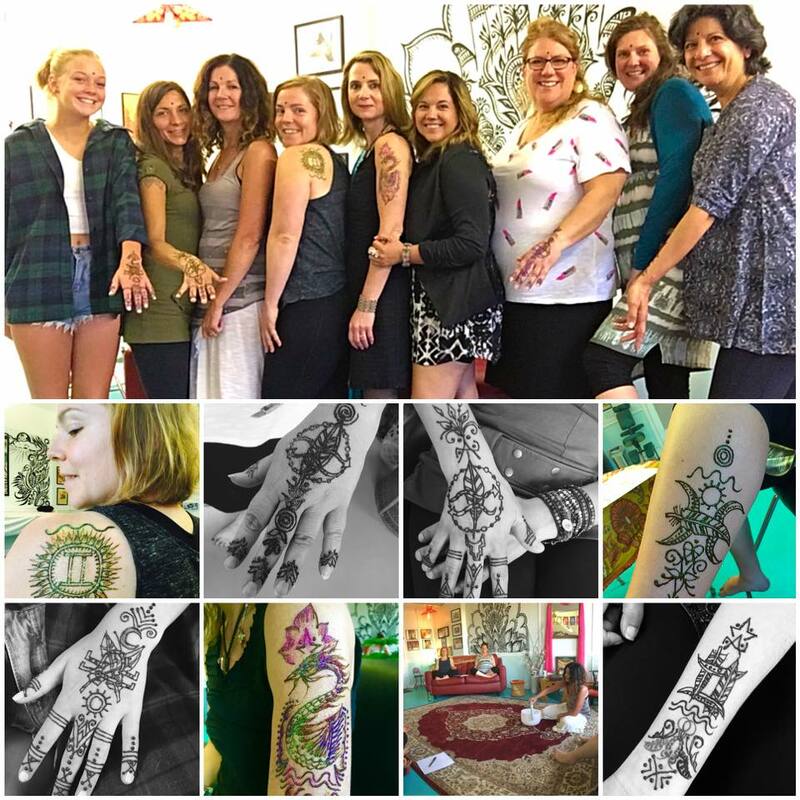 HennAstrology at The Eye of Henna on Saturday, February 18th 11 am to 1 pm. Info and sign up. 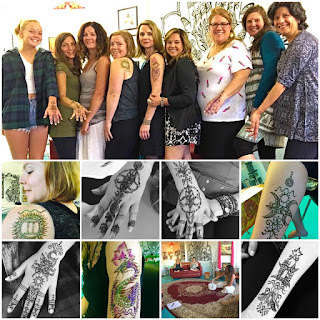 Astrology insights & Henna Tattoos by Mary Schmaling. Oh yeah. Thursday: Powerful day with Full Moon in Cancer intensifying emotional connections and feelings while Mercury moves back into Capricorn and Venus and Neptune join forces in Pisces. The personal part of everything will seem to be most important whether it's beautiful romance or good news shared as a couple. Or at the other end of the spectrum, any slight or loss will hold extra weight in the emotional body and mind. Whatever you're surrounded by or immersed in, keep family, home, security, and sensitivity in mind. Mercury moving back to Capricorn means revisiting and perhaps resolving unfinished business. Keep perspective on how you feel and what your responses are and try not to 'miss the boat' because you're consumed by feelings that will indeed pass. Full Moon exact at 6:34 am ET, void of course Moon time begins then and ends with Leo Moon taking over at 7:08 pm ET. A night for friendship and creative projects. Today's color is Silver. Friday: Leo Moon with no major angles in the zodiac. Do all things 'Leo' including finding reasons to dress up, celebrate, be with children, do what you enjoy and feel passionate about. Today's color is Purple. Saturday: Leo Moon in harmony with Saturn, Jupiter and Uranus before moving into void time at 10:17 am ET. For 12 1/2 hours, the void of course Moon favors ease, lightness and play over business, shopping or making major decisions. At 10:52 pm ET, the Moon sails to Virgo. Practical thinking and decisions come easier during the next 24 hours. Wear Navy Blue. Sunday: Virgo Moon aligns with Mercury in Cap and opposes Venus/Neptune in Pisces. Relationships, discussions and decisions are highlighted. Blend ideals and realism and find balance in complementary ways. Pink is today's color. Monday: Virgo Moon aligns with Pluto, squares Saturn in Sag and opposes Mars in Pisces. Complex problem solving and sorting are favored. Effort is required as is compromise. Mix creative and practical methods. Brown is today's color. Tuesday: From 1:09 to 6:16 am ET, the Moon is void of course. Moon moves to Libra. Moon squares Mercury in Capricorn and you may find yourself negotiating or re-negotiating to create more fairness, justice, harmony and respect. Today's color is Blue. Wednesday: Libra Moon square Pluto and opposite Uranus. Again, a retracing is in the forecast. Revisiting an old issue or unresolved feelings may happen naturally or unexpectedly. Temper your responses. In other words, try not to let things get snippy or sharp. Remember, people and feelings and respect. Today's color is Lavender. Restorative with Reiki, Essential Oil and Sound Healing also at Scarborough Yoga on February 26th. Reiki by Addie Powers. Sign up here or in studio while spaces last. Happy New Year! Your gratuities are much appreciated. Thank you. Learn more about the meridians that run through your body and keep the chi flowing with deep stretches. During the first 4 classes, I'll introduce or re-introduce 6-8 meridian paths, organ associations, and energies and emotions of each. Jumpstart your meditation practice if you wish. Understand your body and unwind physically and emotionally. Come to Riverbend Fridays! Thursday: Aries Moon squares Sun and Pluto in Capricorn and meets Uranus. Problem solving and decisions require focus and effort. Try not to blow things off. Use your power thoughtfully and wisely. Face a fear with the potential of conquering it. Today's color is Maroon. Friday: Moon from Aries to Taurus void of course 1:41 to 3:18 pm ET. Moon in harmony with Saturn and Mercury while in Aries and later forms a trine to Venus. Experience sensuality, romance, and all the senses have to offer. Tune into the present and live the moments fully. Taurus Moon after 3:18 pm means make only promises you intend to keep. Today's color is Pink. Saturday: Taurus Moon in harmony with several planets, and the Sun meets Pluto in Capricorn. Earth and water energies are strong. Be constructive with emotions. Ground in realities. Be practical and creative simultaneously. Build, cook, care for plants and the earth. Be outside for enjoyment. Void Moon begins at 923 pm ET. Today's color is Green. Sunday: Taurus Moon void of course until 5:06 pm ET. Mercury stations direct at 4:43 am, but don't move too fast. Today is best for pausing. Take your time with everything. Socialize and relax or take care of routine tasks that require little thought. Mercury is presently in Sagittarius. Travel could be delayed or confusing today. Wear Yellow. Monday: Gemini Moon squares Venus, Neptune and Mars in Pisces. Question everything. Be skeptical. See if actions match words. Expect sensitivity and speak and act accordingly. Mercury is paused before moving forward and with the Moon and planets acting in mutable signs, everything is quite changeable and not necessarily trustworthy or stable. Be artistic and experiment. Try to be reliable in an unreliable world. Today's color is Blue. Tuesday: Gemini Moon will shift to Cancer on this split personality of a day/night. Early in the day negotiations and business keeps things hopping. Writers may be inspired. Quick thinking may be necessary. Saturn opposes the Moon and people could be disagreeable or argue. Sun squares Uranus and control issues may come up. People may act in sudden, rash ways. Void Moon 4:38 to 5:49 pm ET, followed by Cancer Moon through much of Thursday. Moon opposes Mercury before changing signs. Debates, old business, effects of words written or spoken as long as weeks ago could all be issues to deal with. Today's color is White. Wednesday: Mars sextile Pluto in Pisces/Capricorn. Cancer Moon trine to Mars and opposite Pluto with easier angle to Venus and Neptune. Tackle problems and deal with family matters. Use creative approaches and avoid feeling resentful. Replace frustration with humor or caring. Relationships and feelings take precedence. Today's color is Light Blue. copyright Robin Ivy Payton, 2017 Do not use or reproduce without permission.